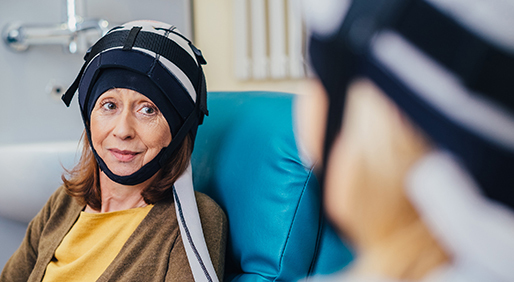 The Food and Drug Administration (FDA) has cleared for marketing the nation’s second cooling cap — Paxman Scalp Cooling System — to reduce hair loss in patients with breast cancer undergoing chemotherapy. The United Kingdom-based company plans to install 250 systems across the U.S. over the next year, working with many cancer centers and large community oncology groups. The development of the scalp cooling system has been a personal mission for Paxman and his family after they saw the effects of chemotherapy firsthand through their mother, Sue Paxman. To ensure her legacy lived on, the company created the cooling caps to better the quality of life of other women around the world battling cancer. A multi-center prospective study of 186 women found that the cold cap preserved hair in more than 50 percent of women who used it, compared with zero percent in the control group. Researchers examined the system in women being treated with neoadjuvant or adjuvant taxane and/or anthracycline–based chemotherapy for their stage 1/2 breast cancer. The multicenter trial was conducted at seven sites across the United States, from December 2013 to September 2016. Scalp cooling works by narrowing the blood vessels beneath the skin of the scalp, reducing the amount of chemotherapy medicine that reaches the hair follicles. Specifically, the Paxman Cooling Cap molds to all head shapes and sizes. The liquid coolant passes through the cap, extracting heat from the patient's scalp, ensuring an even, constant temperature is maintained to minimize hair loss. The Dignitana DigniCap Cooling System was the first to be given clearance by the FDA in December 2015. The decision was based on a study of 122 women with stage 1/2 breast cancer undergoing alopecia-inducing chemotherapy. More than 66 percent of the women who used the DigniCap lost less than half of their hair, and no reported severe side events. Common side effects after using the cooling cap include cold-induced headaches, neck and shoulder discomfort, chills and pain.The price of cooling caps varies depending on the manufacturer, the number of chemotherapy sessions and the number of months that the caps need to be used. According to Paxman, patients using their scalp cooling treatment will only pay for their own cap and the treatment they use.